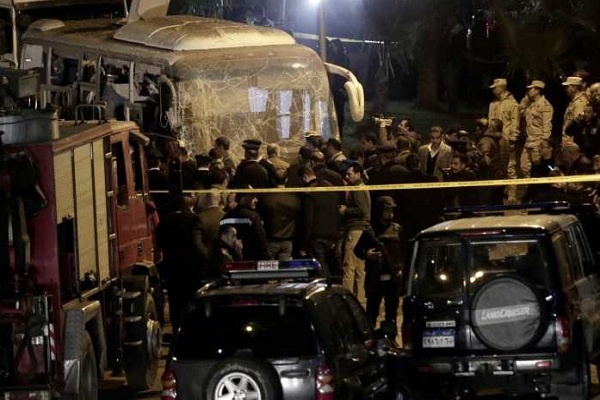 Egypt's security forces have killed 40 militants in raids on their hideouts in Sinai Peninsula and Greater Cairo area hours after a roadside bomb targeted a tourist bus in the capital, killing three Vietnamese tourists and their Egyptian guide. In a Saturday statement, the Interior Ministry said 10 of the militants were killed when the forces stormed their hideout in El Arish, a coastal city in the turbulent north of Sinai, reported AP. Another 14 were killed in the Cairo suburb of October 6 and 16 more in a housing project on a highway heading west from the Egyptian capital. It said the militants were preparing for attacks on government and tourism facilities, army and police personnel as well as churches, it said. The area of attack, Marioutiyah, near the famed Giza Pyramids, has seen a series of attacks over the past two years, mostly targeting the police, the report added.